Ahoy there, readers! What comes in your mind when you hear this word compass? Yes, it is kind of confusing, isn’t it? But, it is possible to figure out meaning of the compass tattoo design. 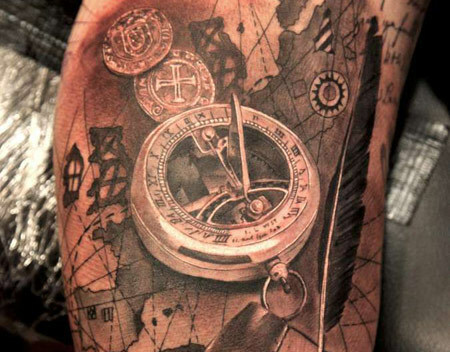 The actual compass design is a popular maritime tattoo, which usually reflects your very long historical past. They also include connected tattoo designs and also sailors, and it is similar to the maritime star in the symbolism. However, many artists have attempted to mark their style making use of their own distinctive models. These compass tattoos are now available in wide varieties and patterns. While some wear them out of fashion, others draw tattoos for denoting any special cause or purpose. Irrespective of the reason of wearing, tattoos remain the best form of body art today as well. Unlike their shapes, compass tattoos are available in many round formats. 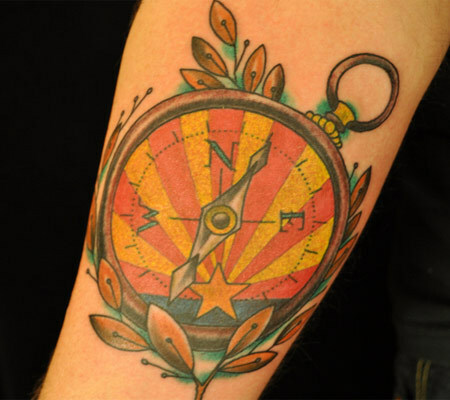 Starting from simple images, you could pick from a large variety of compass tattoo patterns. Check out some of the coolest compass patterns ever. Here compass is an additional element embedded in the Russian doll. Located at the belly of the fat doll, the compass signifies floating time. 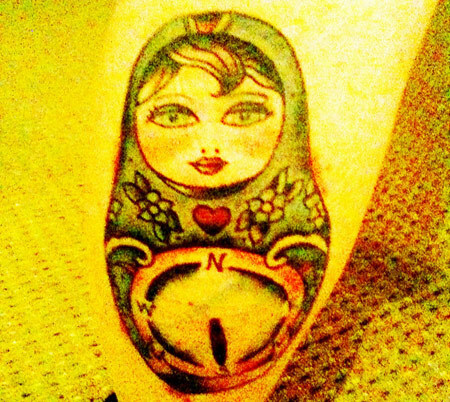 Colorful in looks, the Russian doll compass tattoo is a girlish one, which looks great on the upper arms. Name of this pattern itself suggests the location of the tattoo. A very stylish compass pattern, the pattern is perfect for one who wears shorts mostly. Though its size is small, it carries a great image bearing the personality of the wearer. Amongst the various designs of compass tattoos, simple compass is the most adorable one. You can wear this pattern in any part of the body. 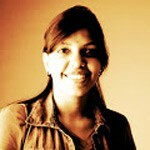 The pattern is generally small in size and applies one or two colors at most. Perfect both for men and women, simple compass are preferred by many people who do not love loud designs. 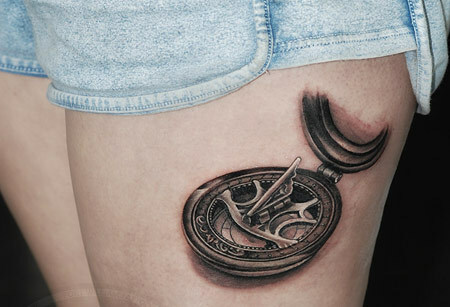 Compass and the olive leaves tattoos are nostalgic tattoos having image of the leaves along with the compass. Colorful in appearance, this pattern is perfect for both men and women. You can choose this pattern confidently, if you are in love with the passing time. 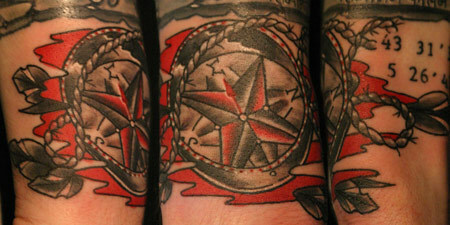 Compass and rope tattoo is a popular pattern of compass tattoo. This one is also a type of sailors’ tattoo, which is another popular pattern. The best place for wearing this tattoo is on the upper arms or the lower back. You can wear the pattern on your abs too, if your abs are toned. 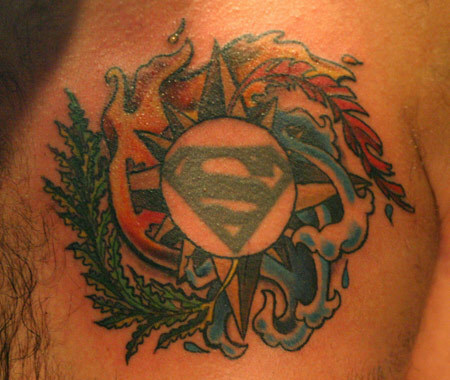 The prime characteristic of this type of tattoo is the subject of the image. They are mostly meaningful tattoos carrying some special significance. For this implication, many celebrities around the world have picked up this pattern as their favorite choice. 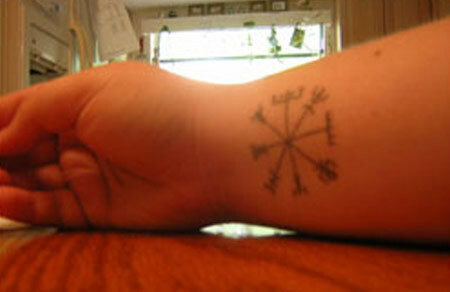 Element compass tattoo is available in both temporary and permanent patterns. Name tattoos will never go out of fashion. 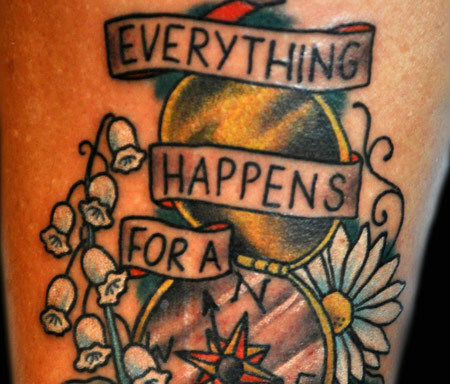 Almost all designer tattoos have something written. Compass tattoos are not exception of this pattern. You can write anything embracing the compass. 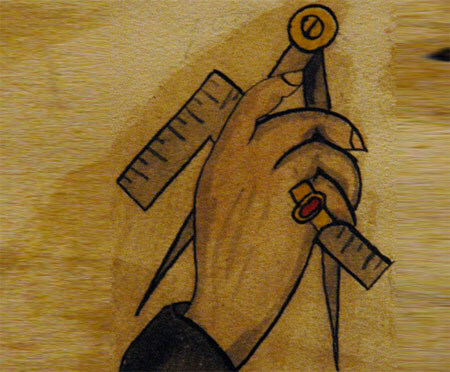 In this pattern of tattoo, compass remains the main object of the imagery. Perfect for both sailors and others, the compass with anchor and map is quite well liked by people. The pattern has been adapted since the time compass tattoos came into fashion. 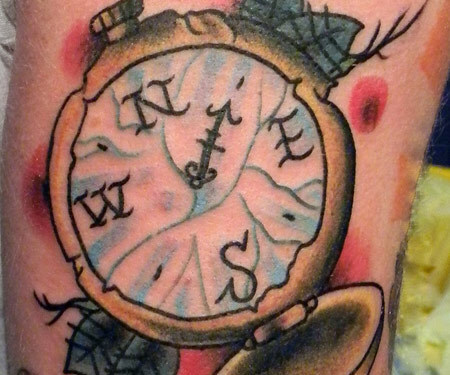 Old school compass tattoos are big and illustrated. They depict simple round shaped compass that are colorful. The pattern is perfect for both men and women. This particular pattern depicts the imagery of manual compass that we generally use in geometry. Basically masculine, this is a perfect tattoo for one who is in engineering. If you are looking for inspirational and distinctive piece of art inscribed on your body, then this genre is what you should pick! Which one of these compass tattoo designs is your favorite? Do leave us a comment! Give your idea ample time to test if you really want it inked, save the spot for a tattoo design that will not be regretted.